On Tuesday 19 March NAVCA held their first ever national awards event in London, showcasing the brilliant achievements of their member organisations. We are delighted that North Tyneside VODA’s Sector Connector project came home with the ‘Collaboration and Partnership Working Award’. The NAVCA Awards have been designed to celebrate local third sector infrastructure – the unsung heroes of our sector – and a total of nine awards were handed out during the evening, including two for the Newcastle CVS. See all the award winners here. Sector Connector recognises that, at a time when voluntary and community organisations are being encouraged to be more entrepreneurial, the private sector has skills and experience that are useful to charities, whilst those same charities and community organisations can help businesses to better understand the communities they serve. The project enables any business, irrespective of size, to engage with its local community, whether it’s through the giving of time by providing one-to-one mentoring and advice; taking part in team volunteering days; sharing skills and expertise by delivering workshops for groups of community organisations; or by becoming trustees. Making free spaces available for voluntary organisations on a two-day Mental Health First Aid training course. Provision of free support to design branding and marketing for a community orchard. Delivery of a workshop on ‘getting the most out of your team’ from a private sector personal coach (feedback from which indicates VCS managers who attended have completely transformed the way that they are working). A collaboration project between the business sector and the voluntary sector to explore the regeneration of North Shields town centre. 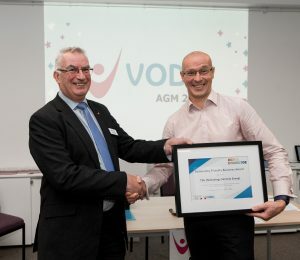 VODA is always looking for new businesses to get involved in the Sector Connector project, if you would like to get involved, please contact Ian Dodds. You can sign up to our Sector Connect e-bulletin here. The Community Business Weekend, delivered by Power to Change, celebrates the 7000 community businesses in local hands across England. 225 community businesses opened their doors in 2018 and used Community Business Weekend to demonstrate the positive impact they have on society and tell their stories of success. Over 17,000 people visited them and found out how community business can make change happen at a local level. Some of them are now new volunteers, shareholders and customers. 97% of community businesses who took part recommended others should too! Locally, Meadow Well Connected showcased all the great services and activities which happen in the centre. Cafe 32 at the Linskill Centre used the opportunity to celebrate ten years of providing a community cafe at Linskill and launch its new summer menu, whilst celebrating with staff, suppliers and the local community. Hosting an open doors event is a great way for you to build your local connections and inspire people to get involved in your community business. Read here to find out more about the 2019 Community Business Weekend and to sign up to take part. Carney Consulting Ltd is offering a free place for voluntary organisations on their Mental Health First Aid course which runs across the year. At a time when there is a need for voluntary organisations to support people with increasingly complex issues, this two day course will help participants to spot the early signs of a mental health issue to feel confident in offering help and support to people with a range of mental health issues. There are seven courses planned for 2019. The next available course is on Tuesday 30th April & Tuesday 7th May. The number of free training places are limited, so please contact Ian Dodds now if you are interested in this opportunity. HSBC is offering to deliver free financial well-being workshops for voluntary sector employees or beneficiaries. 1 in 3 employees say that they are distracted at work by financial concerns. Please contact Ian Dodds now if you are interested in this opportunity. Sector Connector Workshops: As part of Sector Connector, a number of businesses volunteer to deliver free workshops on a range of topics that may be beneficial to the voluntary and community sector. As such, if there are any particular topics or business skills that you think your organisation might benefit from and that could be the subject of a future Sector Connector workshop, please get in touch with Ian Dodds. 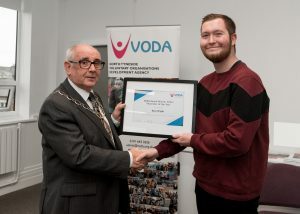 We are delighted to share the stories of our award winners for 2018, who were presented with their prizes at our recent AGM by Chairman of North Tyneside, Cllr Tommy Mulvenna. Pathways4All is a parent-led charity providing a range of activities and events specifically tailored for children with disabilities and additional needs and their families. 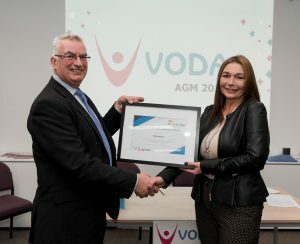 TSG were recognised for their involvement in VODA’s Sector Connector project, in particular their donation of laptops which has helped people and volunteers in the community to carry out short-term social action projects around youth employability, Universal Credit applications and awareness raising campaigns. 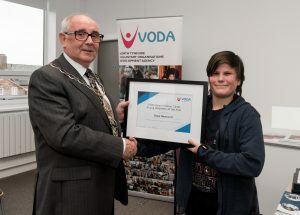 Ali Donkin of Turncoach was presented the Community Friendly Business Award for delivering several free workshops on team building and personal development for the benefit of voluntary and community groups and young volunteers in North Tyneside. We’re here to provide support, advice and training to volunteers and voluntary and community groups in North Tyneside. Please explore our website to find out more about the services we provide, or contact us for further information. 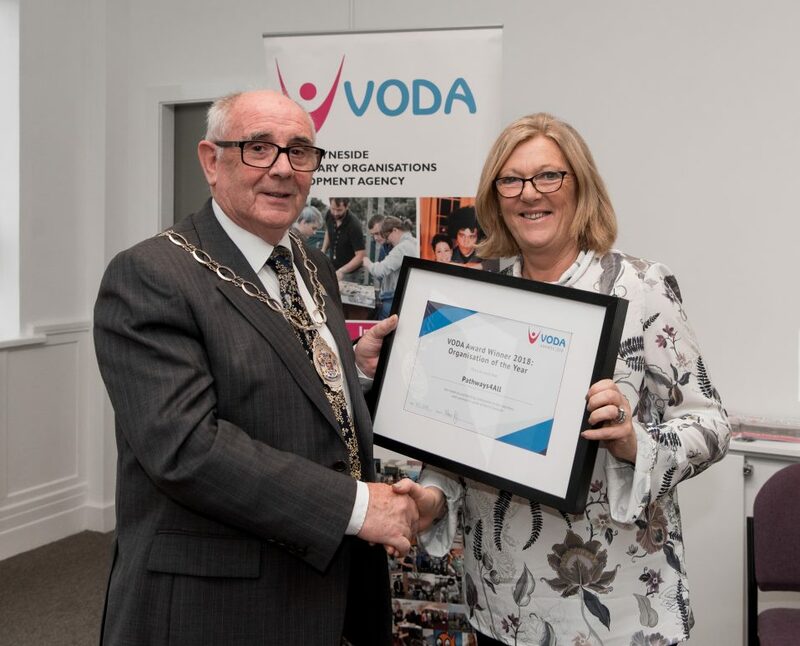 Thank you for your booking: VODA Award Winners 2018!. We will be in touch soon to confirm your place.